For a NEMA-6 rated and similar design level switches see LVN-60 series as an alternate. 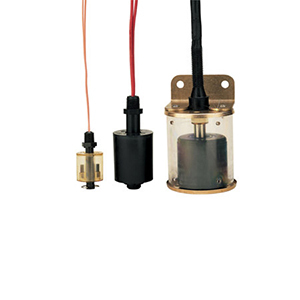 Offering high reliability at low cost, the LV-60 Series level switch is recommended for many OEM applications. The all polysulfone (PSF) construction provides excellent chemical resistance and is rated to a maximum 225°F. Extremely compact, the switch is ideal for restricted or limited space. The reed switch design allows the user to select as either normally open or normally closed by simply removing the retaining clip and inverting the position of the float. When turbulent tank conditions prevail, the LV-70 Series level switch will provide highly stable and accurate level detection. A protective slosh shield allows contact with nonstatic, highly contaminated liquids and minimizes the effects of turbulence and motion. Mounting brackets attach to a wall, bracing, sounding tube or any convenient surface. The LV-80 Series’ all-CPVC construction offers resistance to many acids, bases and aqueous solutions, making these switches well suited for chemical and plating applications. The sensor mounts vertically at either the top or bottom of the tank and is extremely easy to install. 참고: N.O. = Normally Open; N.C. = Normally Closed *All units field switchable for normally open, normally closed.